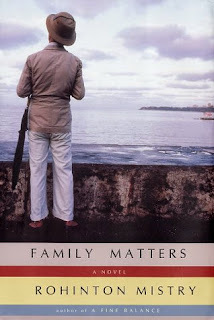 I haven't read any other novels by this author...will check out 'Family Matters' Thanks for your post!! That'd probably be better, yes. I didn't know he was in Canada either, all I know is, where he was born is close to me! Hope you get around to reading A Fine Balance.. I've had this one on my shelf for over a year and just haven't gotten around to reading it. I'm tempted to pick it up but not sure how far I'll get . . .
Well, I won't suggest you to hurry into reading this one! I've noticed only people who are already familiar with Mistry's writing seem to love it.